What is so funny about naked pictures and drugs? Beats me. Maybe they were drunk or high when they created the Twitter account, which tells you even more about the teacher’s private life than we want to know. AURORA — Cherry Creek School District put a teacher on administrative leave Tuesday after 9News discovered a Twitter page containing half-naked photos of her and a claim of possessing marijuana on school grounds. The station started asking questions about the now-deleted CarlyCrunkBear (@crunk_bear) Twitter account after getting a tip from a viewer Monday. In a brief interview, Carly McKinney, a 23-year-old math teacher at Overland High School, admitted that she created the account with a friend. The Twitter page included provocative photos along with many posts about using drugs. It was supposed to be a funny blog, but for some reason his boss didn’t see it that way. I wonder how his identity was made known. I definitely wouldn’t reveal my identity if I kept a less serious blog or wrote politically-incorrect content. Matt Watson lost his job at a Georgetown coffee shop, after being outed as The Bitter Barista blogger. His boss didn’t appreciate the snarky comments about himself or the customers, even if was meant as satire. Meet Matt Watson, 30, who just lost his job at All City Coffee in Georgetown that he had for 2½ years. That’s what happens when you’ve become the Bitter Barista, start blogging snarky stuff about your customers, and it goes viral. According to market researchers, the NPD Group, there were an astounding 1,640 coffee shops in the Puget Sound area in 2011, ranking us the No. 1 coffee region in the country. In the birthplace of Starbucks, and in one of the most Internet-connected cities in the country, it seems appropriate that there’d be a blog about the relationship between customer and server. It is Starbucks, after all, that in the last three decades helped coin the term “barista” as common usage for coffee servers. In Italy, the description is applied to someone working behind a bar, serving not just coffee but also alcoholic drinks. Watson says that his blog was satire and that he was just accentuating “the 5 percent who I guess make our job more difficult and don’t treat us as human beings. I had a good personal relationship with 95 percent of customers.” He says he thought very highly of his boss, Seth Levy. And here they are, working for minimum wage plus tips, which for Watson totaled about $15 an hour for a job that for him started at 6 in the morning. He’s now married to a different woman, and they live in a Capitol Hill apartment. The barista job, Watson says, was to help make ends meet while he pursued a career as a hip hop artist going by the name “Spekulation.” That’s what he means about baristas being artistic types. Watson went live two weeks ago with the Bitter Barista blog. Soon it began getting a couple thousand hits a day. In it, he doesn’t mention All City Coffee, or his real name. But he did mention in his Spekulation tweets what he was doing. Yes, the barista world is a small, gossipy world. Watson knew he was in trouble. Levy didn’t quite see it that way. And so Watson was out of a job. Watson says he’s had several offers from other coffeehouses. And, he says, he hopes to put together a Bitter Barista coffee-table book. This is a typical story of an employee who complains about her customer on social media and got fired. What is unusual about the story is the customer who was the subject of the complaint was identified and “exposed,” causing her great embarrassment. 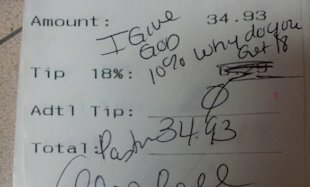 An Applebee’s waitress who posted a receipt with a note from a pastor complaining about the automatic gratuity added to the bill on the Internet was fired on Wednesday after the pastor complained to her manager. Bell, a pastor at Truth in the World Deliverance Ministries Church, was not amused, and she called Welch’s manager to complain.